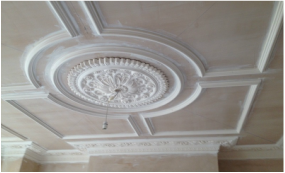 Plaster specialist in period reproduction plaster mouldings, matching existing plaster coving, period plaster cornice, ceiling roses, dados, picture rails and decorative plaster mouldings. Comprehensive coving and plaster mouldings restoration. Having worked for decades producing architectural plaster covings for historic buildings, we have the skills and experience to faithfully restore or reproduce your existing work, like plaster coving, plaster cornice and any coving style of decorative plaster cornicing. We can adapt designs from our own extensive collection of plaster mouldings, or we can reproduce work from any design or specification, to follow any curve or radius. Any of our catalogue plaster coving can be produced to any curve as well. We can copy and reproduce existing historic work for replacement or use in renovations or additions or to replace existing plaster mouldings too damaged to restore. Where important historic fabric has been damaged by time or neglect, we have developed time tested methods for restoring and stabilizing it in place. Plaster coving is still the designer's material of choice for defining the mood and impression of the space just as it has been for centuries. It will accept most finishes, it will neither shrink and warp, burn nor produce toxic fumes and no insect or animal will eat it. We look forward to furnishing you with the most cost effective proposal for "restoration" of the architectural plaster mouldings in your historic period structure. 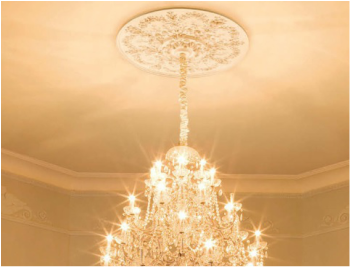 At Decor mouldings plaster coving shop we can match your existing coving plaster cornicing or decorative plaster mouldings for needs like plaster ceiling cornicing, plaster cornice or dados wall designs, we are either have the coving or plaster cornice you need or be able to assist in designing and reproducing any period style plaster coving, like Victorian coving, Georgian, Edwardian, Art-deco coving design of your existing or ceiling roses to your existing and new specifications, please give as a call, We will be more than happy to assist you and help you with your project. “Ange is in my opinion, the leading craftsman in his specialized field based on his skill, knowledge, experience and integrity. His company Decor mouldings plaster coving shop is a well-organized extension of himself. We have chosen to work with Ange almost exclusively on decorative historic restoration work for over nine years in recognition of his overall abilities.